LAUREL, Maryland, February 28, 2013 (ENS) – NASA’s twin Van Allen Probes, robotic satellites launched last August, have now revealed a previously unknown third radiation belt around the Earth. “We thought we knew the radiation belts, but we don’t,” said Nicky Fox, Van Allen Probes deputy project scientist at the Johns Hopkins University Applied Physics Laboratory in Laurel. This lab team built the spacecraft and manages the mission for NASA. “Even 55 years after their discovery, Earth’s radiation belts still are capable of surprising us,” said Fox. 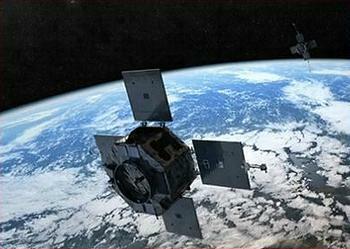 Earth’s two radiation belts were one of the first discoveries of the Space Age. They are named after James Alfred Van Allen, an American space scientist at the University of Iowa. Van Allen was first to devise a balloon-rocket combination, called a “rockoon,” that lifted rockets on balloons high above most of Earth’s atmosphere before firing them even higher. In 1953 rockoons fired off Newfoundland detected the first hint of radiation belts surrounding Earth. Five years later, Van Allen was first to urge that a Geiger counter be used to detect charged particles in space on the 1958 U.S. satellite missions Explorer 1 and Explorer 3. 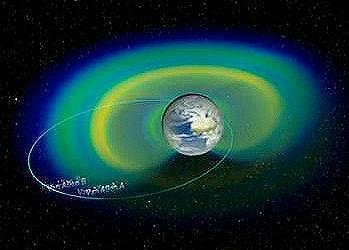 The discovery of the third radiation belt, an isolated third ring in the outer radiation belt, was published in today’s issue of the journal “Science.” It is based on data from the twin Van Allen Probes. The Van Allen Probes are on a mission to explore aspects of the connected Sun-Earth system that directly affect human life and society. NASA’s Goddard Space Flight Center manages the overall Living With a Star program, of which the Van Allen Probes a part. Each of the two probes carries an identical set of five instrument suites that allow scientists to gather data on the radiation belts in unprecedented detail. The two probes must operate in the harsh conditions they are studying, NASA explains. Other satellites have the luxury of turning off or protecting themselves in the middle of intense space weather, but the Van Allen Probes must continue to collect data. So the probes have been built to withstand the constant bombardment of particles and radiation in this intense area of space. Key data for discovery of the third radiation belt came from the Relativistic Electron Proton Telescope, or REPT, which is part of one of the probes’ five instrument suites – the Energetic Particle, Composition, and Thermal Plasma Suite. “This is the first time we have had such high-resolution instruments look at time, space and energy together in the outer belt,” says Daniel Baker, lead author of the study and REPT instrument lead at the Laboratory for Atmospheric and Space Physics at the University of Colorado, Boulder. Back in the 1950s when the radiation belts were discovered, few people noticed. But today knowledge of the radiation belts is crucial to the performance of electronics here on Earth. Hundreds of satellites used for weather prediction, GPS, television and many other services routinely skim the belts, subjecting themselves to energetic particles that can damage solar panels and short-circuit sensitive electronics. During geomagnetic storms when the belts are swollen by solar activity, whole fleets of satellites can be engulfed, imperiling the technological underpinnings of daily life on the planet below. Discover which processes – singly or in combination – accelerate and transport the particles in the radiation belt, and under what conditions. Understand and quantify the loss of electrons from the radiation belts. Determine the balance between the processes that cause electron acceleration and those that cause losses. Understand how the radiation belts change in the context of geomagnetic storms.